Although the material wealth that you accumulate over the course of your lifetime is something to be proud of, and should be protected, it is the people with whom you form close relationships in your life that undoubtedly matter the most. Fortunately, a well thought out estate plan can help protect both your estate assets and the people that matter to you. At Hedeker Law Ltd, we look forward to helping you create your estate plan. Like most of Illinois, the Village of Barrington was originally home to indigenous peoples, specifically the Native American Prairie Potawatomi and Mascoutin tribes. Through a series of treaties signed in the early part of the 19th century, most of the land once known as the Northwest Territory, including the modern day Village of Barrington, was ceded to the United States, presumably in return for payments in the form of annuities and grants. The first European settlers to arrive and settle in the area did so in 1834. Other settlers from New York and Vermont followed shortly thereafter. Barrington was originally named Miller Grove after the family of pioneers by that name settled there early on; however, many historians believe it was later renamed Barrington Center after the Great Barrington in Berkshire County, Massachusetts from which many early settlers emigrated. Like many other cities at the time, the growth of the Village of Barrington was indelibly linked to the expansion of the railroads during the latter half of the 19th and early part of the 20th centuries. In 1854, the Chicago, St. Paul & Fond du Lac Railroad (now known as the Union Pacific/Northwest Line), extended the train line to the northwest corner of Cook County, bringing a station very close to Barrington. The corresponding growth in the area led to Barrington’s incorporation on February 16, 1865. Sadly, several major fires that occurred around the turn of the 20th century destroyed many of the buildings in downtown Barrington. That destruction, however, led to replacing the burned frame structures with more substantial brick and stone buildings. Many of those buildings remain in use today with some designated as historic structures included on the Village Center tour. The Village of Barrington earned a place in the country’s history on November 27, 1934 as a result of a running gun battle that occurred in the village between FBI agents and Public Enemy Number One — Baby Face Nelson. The gunfight resulted in the deaths of Special Agent Herman “Ed” Hollis and Inspector Samuel P. Cowley. Despite being shot nine times, Baby Face Nelson escaped the gunfight only to die later that night. Today, the Village of Barrington offers residents and visitors over 117 specialty retailers and 40 restaurants in the quaint downtown area as well as wetlands, forest preserves, parks, and horse trails surrounding downtown. Visitors to Barrington will not want to miss a stroll through the state’s largest residential historic district. Given the importance of the finished product, care should be taken throughout every step of the estate planning process, starting with your choice of an estate planning attorney to work with you on your plan. 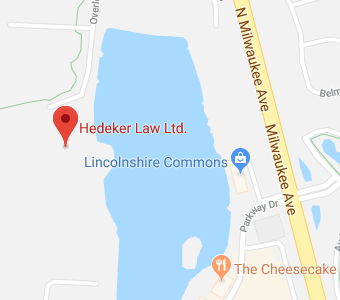 The competent and caring estate planning attorneys at Hedeker Law Ltd. have dedicated their practice to helping people just like you with their estate planning needs. We would be honored to sit down with you and help with the creation of your estate plan. Ideally, estate planning should begin when you are a young adult just starting out in your career. At that time, your only estate planning goal may be to avoid leaving behind an intestate estate in the event something tragic were to happen. It won’t be long, however, before you outgrow that initial plan and need to review and revise that initial plan. The fact that your estate plan will need to grow along with your estate and your family is one of the numerous reasons why it is important to establish a comfortable working relationship with your estate planning attorney. Every estate plan should be routinely updated; however, there are a number of life changes that should also spur a more immediate revision to your estate plan. When you get married and/or become a parent, for example, you will undoubtedly want to include your new family members as beneficiaries in your Last Will and Testament. You may also decide to appoint your spouse to fiduciary roles throughout your expanded estate plan. A plan that may now include a trust to protect the inheritance of your minor child. The growth both in size and value of your estate assets may also call for the inclusion of asset protection as well as probate and tax avoidance strategies to your plan. Looking toward your retirement years may prompt you to incorporate long-term care and Medicaid planning into your estate plan as well as merge your retirement plan with your estate plan to ensure they work well together. It may also cause you to consider your feelings on end of life medical treatment as well as contemplate your own funeral and burial. If you have strong feelings or beliefs about either end of life medical treatment or the disposition of your body after you are gone, there are estate planning tools and strategies that can be used to ensure your wishes on either, or both, are honored. At the estate planning firm of Hedeker Law Ltd. we know it can be difficult to discuss deeply personal, and often sensitive, estate planning issues with a stranger which is why we strive to create lifelong relationships with our clients that allow us to help protect you, your assets, and your loved ones. If you have additional questions or concerns regarding estate planning, or if you are ready to get started on your plan, contact the Barrington, Illinois estate planning attorneys at Hedeker Law Ltd. by calling (847) 913-5415 to schedule your initial consultation.